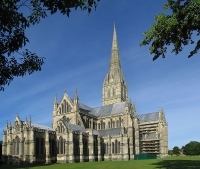 The city of Salisbury is dominated by the spire of its famous cathedral, the tallest in England at 404 feet (123m). Started in 1220, the cathedral was completed in 1258, and the Spire added a few years later. Built to reflect the glory of God in stone and glass, this majestic and awe-inspiring church has been a setting for many great occasions in its 775-year history. The grounds of the cathedral contain many notable houses, which are open to the public. Mompesson House is a perfectly-preserved 18th-century home, and Malmesbury House was once the sanctuary of King Charles II, fleeing the Battle of Worcester in the 17th century. Salisbury Cathedral is one of England's greatest old churches and historic pilgrimage sites and is well worth a visit for tourists.